In February we headed out on our annual pilgrimage somewhere south to avoid a few weeks of nasty Canadian weather. Usually, it’s a simple hop to Toronto and then onward to – well, just about anywhere “down south” as winter-weary Canadians like to say. This year, our four weeks away found us on no less than ten – yes ten—airplane segments on three different airlines. Needless to say, there is going to be a certain amount of comparing going on. Soaring over the Napali coast. We began our trip on our trusty Air Canada to whom we are quite loyal. There is much for a discerning traveler to gain from being loyal. Travel blogger and co-founder of airfare-prediction site FlightCaster Evan Konwiser (who knows more about airline loyalty programs than we ever will) offers five golden rules for air travels that include, among others, never travel anywhere without earning miles of one sort or another and focus on one airline at a time (you can read the rest of the rules at The Golden Rules of Loyalty Programs, and you should!). We agree and have, indeed, gained elite status giving us some of the perks that make comfortable flying less of an oxymoron. However, it doesn’t always work out that you can fly on your favorite – or even on one of its alliance members. Air Canada belongs to the Star Alliance so when we’re connecting to places where AC doesn’t fly, we usually book a Star Alliance partner (then we can still earn loyalty miles). This year, that meant flying on United Airlines from LA to Honolulu since we were stopping in LA for a few days enroute. Oh dear, when Dorothy realized she wasn’t in Kansas anymore, she was predicting how an Air Canada frequent flyer would feel when faced with what passes for first class (yes, that’s what our ticket said) on this partner airline. Since we are among the older (one boomer and one beyond) members of the population, we have no issue with older workers. However, when flight attendants look like they should be lounging poolside at a retirement village in Florida, and have to turn sideways to make it up the aisles, we do begin to wonder how efficiently they would be able to move when faced with an emergency. And what’s with all that scowling at passengers? Then we had a great laugh when we saw the movie screen at the front of the cabin with its one movie on offer – we haven’t seen one of those since—well, since the last time we flew on an American-based airline a few years ago on our way to Puerto Rico (where Air Canada inconveniently does not fly). A word of advice to our dear American friends: You really need to take a lesson from your partners north of the 49th parallel and in Europe (see Lufthansa). Air Canada customers may complain as much as the rest of the flying world, but it’s clear to us most of the whiners haven’t traveled on American-based airlines lately. We did, however, get safely to our destination relatively on time and with our luggage. Who can reasonably ask for more these days? Well, we can now that we’re-experienced Hawaiian Airlines – so our theory about American-based airlines doesn’t really hold up. Our first experience with Hawaiian was some 10 years ago when we first ventured to Hawaii. On our trip between Honolulu and Maui, we were booked on Hawaiian. Our most vigorous memory of that event was the panic that preceded boarding: there were no assigned seats and the queuing began very early with a mad dash when the flight was called. Our heads were spinning by the time we finally got on board and found remaining seats. Needless to say that when we found ourselves booked on Hawaiian again, we were concerned. 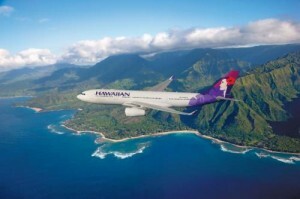 We could have saved ourselves needless consternation because Hawaiian Airlines is what we would call a flawless operation from beginning to end – and we took four of their flights in a two-week period. 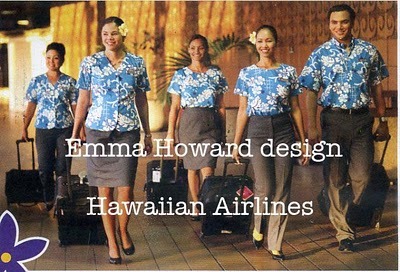 In 2012 Hawaiian Airlines commissioned textile designer Emma Howard to design the Hawaiian pattern for the new uniforms. They are wonderful. Where does Hawaiian Airlines find its people? To a person, they were flawlessly personable and helpful. When we arrived at the airport in Honolulu to catch our flight to Kaua’i we were hopelessly confused at the baggage drop-off. And we were not alone. The system did seem a bit foreign, but helpful agents were able to get us in the right line, and now we know how to navigate their system. (Let’s face it, the variations in policies regarding check-in and baggage drop off among airlines throughout the world is mind-boggling. It would be nice if they could get it together. This is a tall order, we fear though, since even the security screening rules differ wildly from one airport to another even in the same country – shoes on, shoes off, cases in a bin, cases not in a bin, sweaters on, sweaters off, aahhh…you understand and we’re digressing). We were flying first-class on these flights, but since the distances are short and many of the airports small (not the case in Honolulu) we did not expect many amenities. We were surprised to learn that there are indeed first-class lounges in all the airports and more than one in Honolulu. Decorated in Hawaiian motifs, the lounges don’t offer much in the line of food or drink – not necessary in these cases – but they are quiet, air-conditioned oases. We heard a number of announcements indicating that Hawaiian Airlines was pleased to offer their customers advanced seat selection which suggested to us that the change was fairly recent. Wonderful! Actually, the reason we booked first class was because of our fear of the panic for seats as a result of our initial experience. We needn’t have worried. Once on board, the flight attendants were happy, helpful and fitted with delightful Hawaiian-inspired uniforms (with prints designed by Hawaiian textile artist Emma Howard) that made us smile. On these short flights, they even managed to get us a drink and a snack – Mai Tai’s were our drink of choice! The people were wonderful—but perhaps even more impressive was the efficiency of this airline. With a mere 30 minutes turn-around time on each occasion, they managed to get the passengers and their luggage off the planes, the embarking passengers and luggage on and get away on time, all without seeming rushed. The morning we flew back from the Big Island to Honolulu on our way home, there had been a computer glitch earlier in the day that had caused some delays. Our flight arrived in Kona 10 minutes late, and with that planned 30 minute-turn-around we fully expected to be late, a situation that might have resulted in rushed connections. Not to fear, though! They still managed to get luggage and passengers off and on, and take off on time – a turnaround time of 21 minutes! You might be thinking that we’re talking about a little turbo-prop plane with few passengers aboard, but they fly 717’s on these routes. These full flights had 123 passengers on board and they still managed it. We watched the baggage handlers efficiently moving luggage on and off the planes, and it seems to us that employees from other airlines could learn a thing or two. In all our years of travel we have never experienced such fast arrival of our luggage – and that goes for small airports throughout the Caribbean. Despite the fact that Hawaiian Airlines is not a member of the Star Alliance and thus we did not accumulate any frequent flyer points for the four flights we took, we enjoyed every minute of it, will do it again (may try one of their trans-Pacific flights next time) and would recommend them to anyone! Choosing a cruise: A discerning guide to getting it right! We hope you enjoy your trip and would love to hear about it – we’ve not been to Tahiti yet. And let us know how Hawaiian works for you on that itinerary. Thanks for stopping by. Thank you for connecting my textile studio with the Hawaiian Airlines uniform!